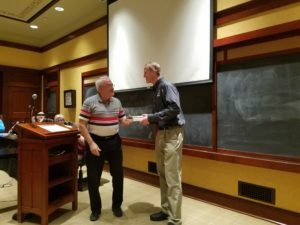 The Perry Rotary Club presented their 2018 Civil Servant of the Year Award at the most recent City Council meeting, and their choice for this year’s honoree was Dr. Clint Lutterman. Lutterman, the Rehabilitation Director for 21st Century Rehab at Dallas County Hospital, was nominated by Tom Lipovac, the Activities Director for the Perry School District. Lipovac lauded Lutterman for his work with the students throughout the year, which included attending to several injuries sustained during sporting events. Lutterman was thankful to Lipovac and the Rotary Club for the recognition of his hard work. The award was presented at the meeting by Perry Rotary member and City Councilman Dr. Randy McCauley. Nominees for the annual Civil Servant Award include those who work or volunteer in law enforcement, the fire department, ambulance squad, health care, human services, and other emergency services. Last year’s honoree was Perry Police Chief Eric Vaughn.